I've been trying out the new Toronto cycling app that allows you to track your trips on your phone (if it's an iPhone or Android). While it has some nominally useful features of showing calories burned and CO2 averted (by comparing it to a car trip I imagine) the main purpose of the app (at least in this iteration) is to help the City gather data on how people cycle now, the characteristics of those people and of the trip, and how the trips change based on changes to the infrastructure. I took it for a spin the other day on my trip to and from the dentist. At the very least, the planners can see the kinds of routes cyclists stitch together to avoid riding on major arterials. On my trip back from the dentist I treated myself to a short section of single track (on my crappy one-speed mountain bike turned city bike) down a hill to a path alongside the Rosehill Reservoir. That got me to Mt. Pleasant (not bike-friendly) and then to Wellesley (quick stop to see the bollards); through King's College Circle; College, Shaw and some alleyways and side streets (contra-flow rulz!) to back home. A route that someone would take only with experience and practice. You might be wondering why the City didn't just use Strava's datasets. Hamish aka "If-it-ain't-bloor-bike-lanes-it's-a-waste-of-money" Wilson, Toronto's resident "carmudgeon", asked this very question in an email rant. Good question. The short answer is that this app isn't geared towards just fredly-types on Cervelos but will also track characteristics of the type of ride (recreational, errand, commute) and of the cyclist (gender, income, comfort-level) while still keeping the data anonymous. But even aside from that, the City can't use or store data out of the country and has extra requirements with privacy laws on the security of the servers. The Oregon Department of Transportation recently went the Strava route by purchasing a dataset that they're using in making design decisions. Their choice has been roundly criticized for using data that is not representative of most cyclists. 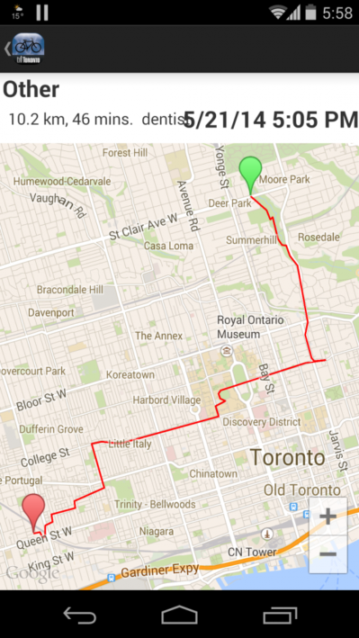 This is perhaps where the Toronto Cycling app will do a better job of getting representative data. By having information about the people cycling they can weight the trip data based on other cycling survey. A researcher noted in her blog, echo in the city (thanks Hamish for the link), that it's okay for ODOT to use nonrepresentative samples so long as there is transparency, "justify decisions and choices about sampling, and use the results responsibly." But, this researcher (I'll call her echo), points out that in the case of ODOT the problem is that the Strava dataset is not that it's a small sample (only 2.5% of all commuters) but that it's likely an "inappropriate sample to address the project goals". Even then, echo notes, the project can be saved. At $20,000 it's cheap so far surveys go, and could be a "great pilot to test how to go about studying cyclists’ behavior using GPS–both in terms of its strengths and limitations as an approach". It appears to me that the Toronto Cycling app will do a better job here. But that's not to say there can't be improvements to the app or the data collection. One major one is to encourage more people to use it. I'm admittedly a bike nerd and went out of my way to install the app and remember to turn it on for every short/long trip. The City should consider offering a raffle to everyone who records X number of trips in a season, where X could be low enough to make it easy for casual cyclists to achieve. This would hopefully increase the types of cyclists that would use it. And the City should not see this as a substitute for surveys but rather a supplement. I have high hopes that this project will prove to be useful. The developers, Brisk Synergies, are focused on technology for transportation (equitable transportation, in fact). Luis F. Miranda-Moreno, chief scientist for Brisk, has done a lot of work on cycling and pedestrian transportation, including a Montreal study with Anne Lusk on its cycle tracks: “Risk of injury for bicycling on cycle tracks versus in the street”. I think the Toronto Cycling app—while needing some improvements—can be a useful tool for improving cycling infrastructure. While my argument is unlikely to convince Hamish, perhaps it's enough for you, my dear reader? The problem with cobbling together data from indirect routes chosen by riders who don't feel safe on arterial roads is that city officials will take it to mean that cyclists actually prefer bike lanes on those indirect routes, even though in an ideal world they'd likely prefer them on arteries which would take them far less out of their way. Many cyclists only avoid arterial roads because of the speed and greater chance of fatal collisions which a bike lane would drastically reduce... but we aren't going to find reasons for avoiding better routes in this app's data. Q: If the city is using this to monitor cycling routes there may be preferred cycling routes that are not taken because of the absence of cycling infrastructure today. For example cyclists may not use streets such as Richmond or Adelaide without cycle tracks, but this does not mean that they are not a suitable corridor for the installation of cycle tracks as part of the downtown cycling network. A: Data for existing use will be logged for routes being used for cycling now, however, broad trends in cycling origin and destination movements will also be analyzed. Data analysis will seek to identify high volume desire lines between neighbourhoods so that future opportunities for cycling infrastructure interventions may be considered on streets where cycling may not be comfortable for most cyclists prior to infrastructure interventions. This app will not be on Rob or Doug Ford's smartphones. Something that's kind of a drag is that the iOS version needs at least iOS 7.1 so that means anyone with an iPhone that's over 4 years old can't run it. You have an iPhone 3? Time to remove the training wheels off your sidewalk bike. Ha! I have such a minimal need for a phone that I'd rather spend my money on other things so this iPhone 3 that was given to me, works fine enough. It's not like it's an old flip phone. This was the hot new item only a few years ago. Now it's considered obsolete for some applications. That's what's cool about bikes. You buy a good quality one and you can use it for a century or so. Spend the same amount on a phone and you have to get another one in 5 years. Oh well. At least we have electronics recycling facilities now. I use the app because i live deep in the east end and cycle to work in downtown west everyday. i like to think my data will be useful as there seems to be fewer cyclists where i live than where i work.